Following changes to Nexus Miscellaneous Works and scholars contracts, which has seen Go North East being awarded with over 70 of the available contracts, this vehicle has transferred from Chester-le-Street Depot to Riverside. 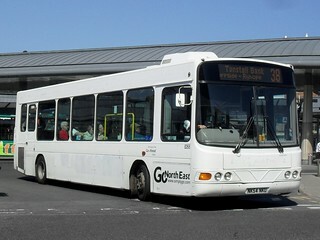 It has been allocated to Riverside to operate the newly awarded contracts at Riverside, and should see primary allocation to those scholars services which later run onto Go North East's own commercial services which operate higher frequencies at peak-times (such as the X21 and 10X) due to the better internal quality of this vehicle and lack of a centre-door. 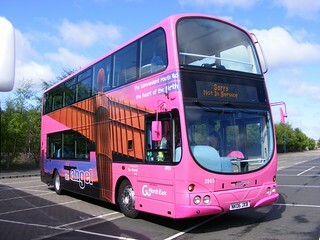 Following the entry into service of new double-deck vehicles on "Angel" service 21, representing a £4.3 million investment, this vehicle has been repainted into Go North East's corporate livery. 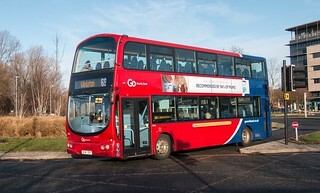 This example has been fitted with the tagline "Stay Connected | Many of our buses have free WiFi on board". 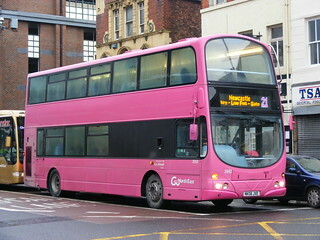 It is planned for both Volvo B7TL/Wright Eclipse Gemini 3962 (JCN 822) and 3965 (574 CPT) to remain at Chester-le-Street and be allocated to the two double-deck boards on services 13/14/X25, to provide a higher quality vehicle on these services following the upgrade of the single-deck boards to higher-quality Scania L94UB/Wright Solar vehicles late last year, and will ultimately lead to the withdrawal of further ex-London Plaxton President bodied Volvo B7TLs from Chester-le-Street's fleet. This vehicle has been refurbished internally with seats re-upholstered into Go North East's standard blue seating moquette. Following temporary loan to Stanley Depot, this vehicle has returned to service at Chester-le-Street. 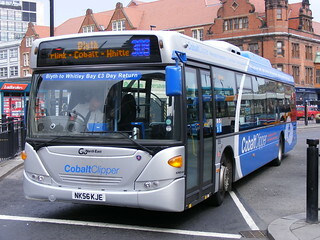 This vehicle has transferred from Chester-le-Street Depot to Stanley, on temporary loan, to alleviate vehicle shortages. 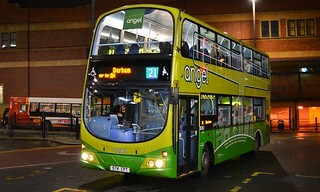 This vehicle has been fitted with Wi-Fi, partially meeting the standard specification of the newer "Angel" branded Volvo B5LH/Wright Eclipse Gemini 2 vehicles which operate on "Angel" service 21. 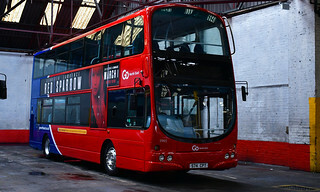 A number of older branded double deckers in the fleet have gained private cherished registration plates. 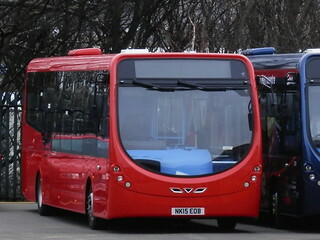 This vehicle has been re-registered as 574 CPT (previously held by "National Express" branded Volvo B9R/Caetano Levante 7104). 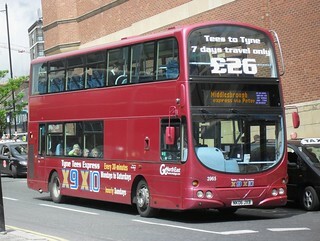 Following the entry into service of new vehicles on "Tyne Tees Xpress" services X9/X10, this vehicle has transferred from Gateshead Depot to Chester-le-Street, joining the new Volvo B5LH/Wright Eclipse Gemini 2 vehicles on "Angel" service 21. 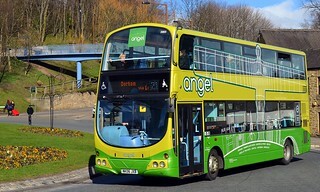 Ahead of impending cascade, this vehicle has been repainted into a green and yellow base livery, later gaining "Angel" branding. 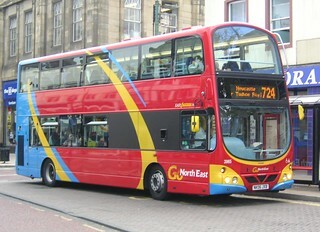 This vehicle has gained "Tyne Tees Express" branding. 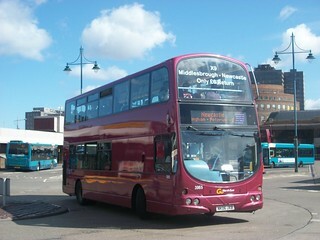 This vehicle has been repainted into a plain burgundy base livery. 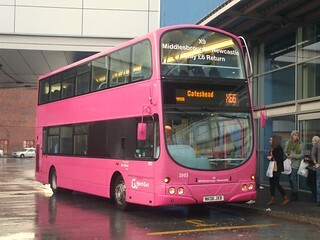 This vehicle has transferred from Chester-le-Street Depot to Gateshead, where it will see allocation to service X9 (Newcastle - Middlesbrough). 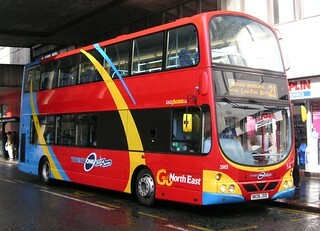 Ahead of impending transfer to Gateshead Depot, this vehicle's "Angel" branding has been removed. This vehicle has gained "Angel" branding. 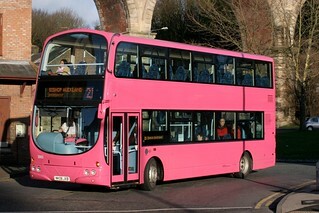 Having recently been repainted to remove old branding for the 724 service, this vehicle has now received "Twenty One, 24 hour service" branding. 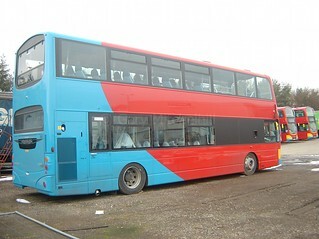 Prior to new branding being launched, this vehicle has been repainted into Go North East's new red, yellow and blue 'swoop-style' fleet livery at Hogarths Coachworks, Birtley. 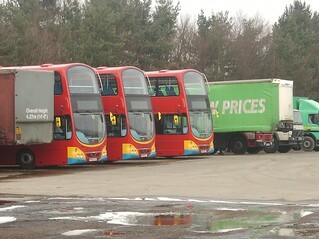 Following the closure of Bishop Auckland Depot and some service revisions, the vehicles previously based at Bishop Auckland have transferred around the region to other depots. This has consequently resulted in a number of re-allocations, including the transfer of this vehicle from Bishop Auckland Depot to Chester-le-Street. 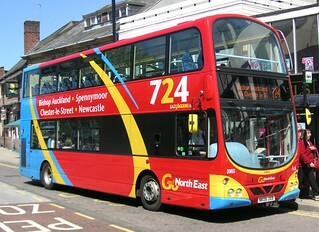 Ahead of its entry into service, this vehicle has gained sub-branding for service 724 (Newcastle - Bishop Auckland). Prior to entering service, this vehicle has surrendered its original registration of NK55OLC and has gained registration mark NK06JXB.